The affiliate program was never a big source of income for me, as it was about 2.5% of each app people bought through my links. Still, something is better than nothing, and the way my site works is that I get revenue from multiple places and they all add up — ads, Patreon, affiliate links. This is one source of revenue just gone, even while I make money for Apple. One thing I pride myself on is that I’ve never done sponsored posts that are basically ads disguised as articles. I refuse to muddy my site with those, as I want people to trust that what they read here is genuine. I hope you know by now that I’m perhaps honest to a fault. I won’t blindly praise a game just to get on a developer’s good side or to sell more of a game for that 5% cut. But with each of these changes, it becomes harder and harder to justify the amount of time and work I invest in my site to make quality walkthroughs, reviews, and gameplay videos. 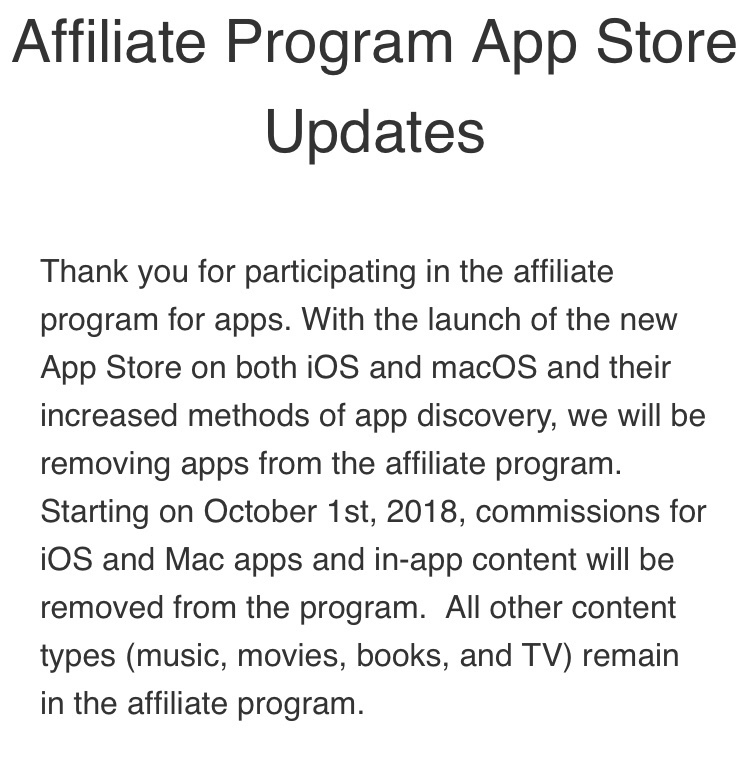 Apple is still continuing the affiliate program for music, books, movies and TV. But as much as I would love to start a Movie/Book/TVUnwrapper, the reality is I’m one person and even building AppUnwrapper to where it is now took almost eight years of blood, sweat and tears. I simply don’t have it in me to start up another site and split my time between writing about different media. There isn’t much you, my readers, can do about Apple’s decision. They’re a powerful juggernaut that will do whatever it takes to amass as much money as possible. And if that means killing off the sites that help them make money, so be it. But what you can do is support me through Patreon. Even $1 per month from 1% of my audience would make a huge difference. If you find value in my work, please consider donating. And if you’re already a Patron, thank you from the bottom of my heart. It means so much when someone is willing to personally invest in the continuation of this site. I’m glad that you use Patreon. As I use Android, your Apple store links have never provided any benefit to you or me, but a minimal Patreon subscription was the right size and means for me. Sorry to hear about this. Of course given my ancient equipment and a lack of desire to keep asking developers “any chance that will still run on my device?” I’ve basically given up on Apple anyway, but it still gets me when they make changes that benefit no one but themselves. I hope you get enough Patreon support to compensate for whatever you’re losing from the affiliate support.